See TALS Fly Tubes in Action! Click Here for a 10 Second Video! 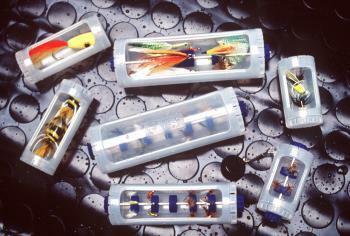 Wet flies, dry flies, poppers, streamers & bass bugs, you can store, protect & organize it all with TALS Tubes. The TALS ##35 Fly Tube (left) and ##25 Fly Tube (right). A rotating carousel is added to the TALS Tubes to create the TALS Fly Tube. 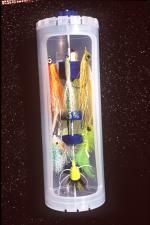 Made up of specially designed Fly Grabber Discs (see below) you simply rotate the outer knob and select your fly. 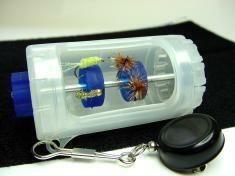 Flies are secured in place by sinking the hook tip into the silicon rubber discs. These soft, tear resistant, "self-healing" discs will not wear out like fly foam. 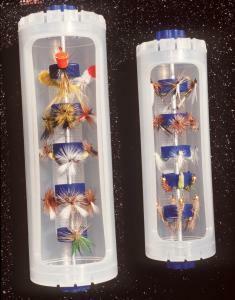 Above, the TALS ##35 Fly Tube (left) Ventilation allows continuous air drying of flies and the disc design and ##25 Fly Tube (right) allows for complete hackle protection. Discs can be slide together to accommodate streamers (see below). Above shows cross section of Fly Tube and close-up of Fly Disc. Notice the counter sunk area in the center of the disc, this allows for vertical arrangement of your flies within the tube. This presents two distinct advantages. 1. The hackles are free from being smashed 360º. 2. The eyelets are facing straight up toward the tube opening in an arcing fashion making it easier to get a hold of the fly you want. Above, TALS #08 Fly Dryer Tube. 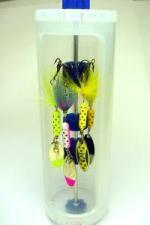 Perfect for storing and drying small trout flies. Only 3" in length it can easily be worn on the outside of the TALS 600 or on a vest. Molded in eyelet for zinger or lanyard attachment. Zinger sold separately see Accessories. #35 Fly Tube adjusted for in-line spinner rack! 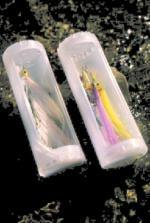 ##30 TALS Tackle Tubes- Great for saltwater flies!